It has been cold. Since Thanksgiving the temperature has hovered at 15 degrees below zero. In the cold, life becomes a series of tasks to keep things warm. Plug in the car, fill the wood stove, warm up the four wheeler, put the dogs in the barn. Repeat, repeat, repeat. I am reminded how much easier my life is than when we first lived here. No longer do I need to make a dash 100 feet to the outhouse at 20 below, awkwardly bundled up, bracing myself for the certain cold of the seat, always trying to remember that I will need my headlamp. No longer do I live with single pane windows that created a significant cold breeze and got so covered in white frost on the inside from the cold glass chilling the humid indoor air, that I could no longer see out. I remember trying in vain to use a car ice scraper on the window above my sink, hoping to recover my view of the dogs. As Max and I sit in the warm house reading Christmas books, I see illustrations of frosty windows and, while beautiful and picturesque, I know they also imply drafts, chilly toes, and a fight with the cold. I remember one of the first Christmases I was in Alaska when I realized as I read “mama in her kerchief and I in my cap” that they were probably wearing them because they were cold. While we hustle around, faces tucked into our coats, trying to keep things thawed, running, and warm, the dogs look at us. Amazingly warm by nature, the frost rims their fur, while their bellies stay hot, providing a good spot to warm up your fingers at you but on their booties and coats. Their meals get hardier, as we add more and more fat to the mix. Their servings get larger, offerings more frequent. Their houses are stuffed with straw, which the dogs push, pull, and rearrange until they are satisfied. Their desire to run is just as strong. The snow cover is still low. Low enough that it is not safe enough to use a sled. The sled would slide just fine, but it requires a firmly packed base to be able to stop the dogs and hold them stopped should you need to get off the sled to fix anything. Because the snow is low we are still able to drive out to the camp Mike maintains for the dogs. Much like a checkpoint in a race, it provides a place for the dogs and mushers to rest in the middle of one of their long runs. Mike, Max, and I drove out to store extra straw and firewood for future training runs. Thomas was running the dogs, getting himself and them ready for the Iditarod. The drive took us past the vast snow flied valleys between mountain ranges and across the Susitna River. The only major obstacle of the drive was overflow. In several places this water has overrun the road, freezing into growing layers of ice covered with wet water. The truck splashed through. Overflow is one of the many challenges the dogs are sure to encounter on the trail. Coaching the dogs to walk carefully over the ice rather than look for another way around is one of the jobs of a musher preparing for a major race such as the Iditarod. 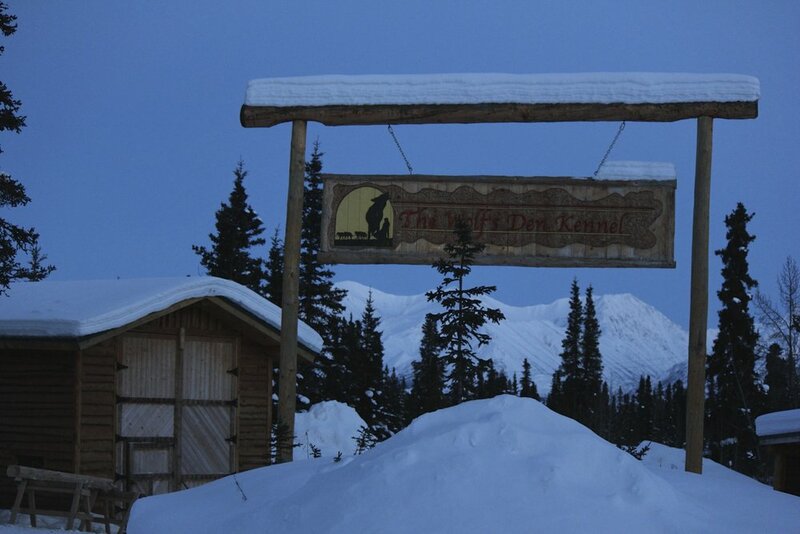 Thomas has been working with us here at The Wolf’s Den and preparing himself for running the Iditarod for three years. A Kansas native, Thomas showed up here with an affection for the Iditarod, but no idea about dogs, Alaska, or winter survival. He has worked tirelessly to improve his knowledge and skill on all accounts. Pulling into camp, I watched him sing along with his headphones as he efficiently tied the team down for a safe rest. He bustled around giving the dogs straw for their bedding and neatly removed their booties. Max and I had already melted the snow for him so that he could feed the dogs. It took 30 gallons of snow to make 5 gallons of water. As the dogs were fed, Thomas’ own meal, safely sealed in a Seal-a-Meal bag, thawed in boiling water. After an eight hour rest, Thomas and the dogs moved back onto the trail, for another seven hour run home. It was a pleasure to see these young dogs on the trail with Thomas. Spunky Yesman up front was charging down the trail. Arson is more serious, quiet and attentive. Vegas led for much of the run. Her drive and athleticism some of the traits we hope she has passed on to her puppies from this summer. You can see pictures of all of the dogs training for races on our website. In fact, if you are still looking for a gift for the person who has everything, you could consider a dog sponsorship. It is a great way to be part of the team making its way to Nome. More information is available on our website or you can email with questions. As many of you who visited this last summer know, it will be Thomas, not Mike who is running the dogs in the Iditarod this year. Mike has been focusing himself on Idita-Dad and the importance of caring for Max. However, Mike will not be sitting home during the race. Just as Mike has enjoyed watching the young dogs develop, coaching Thomas has been a rewarding experience. It has not been without challenge to help Thomas develop the instincts necessary to be successful in a feat such as the Iditarod, but ultimately watching him grow and move towards fulfilling his dream of running the Iditarod has been satisfying. It has also helped Mike develop coaching skills which, no doubt, will be useful as Max gets older. As the start date of the Iditarod has approached, Mike’s restless nature has caused him to dream up a way to be involved in the race. He has decided that he will follow the Iditarod by snowmobile. He will cover the same ground as the mushers, and watch with pride the human and canines he has coached. Not one for small ideas, Mike has decided to take this adventure one step further by inviting Thomas’ father, Richard, to join him. Thomas’ father has been a long time fan of the race and bringing him along will allow Mike to help not only Thomas, but also Richard fulfill an Iditarod dream, and at the same time allow him to witness his son’s success. Mike will be bringing the Iditarod to life, blogging from the trail with insights, trail conditions, descriptions of the places they are visiting, and ideas about how the race is developing. I will share these updates, stories and photos with you. If you know someone who may be captivated by the Last Great Race on Earth, let them know about our newsletter. While the Iditarod training and planning hours are long, today marks the shortest day of the year. However, it is far from dark outside. Even though the sun has been down for hours, the yard is fully illuminated, as “The moon on the breast of the new-fallen snow gives the luster of midday to objects below.” May your holiday time be filled with treats and affection for humans and dogs.